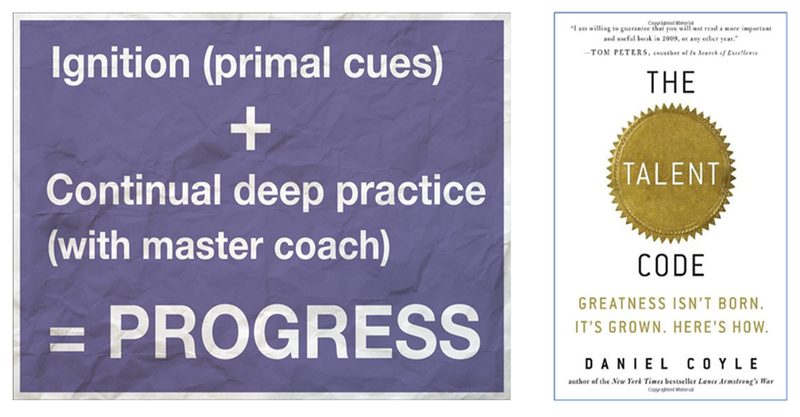 Always in the pursuit of doing better for the students I teach, two posts have made me reflect deeply on my practice this week. 1. Knowledge organisers by Joe Kirby. 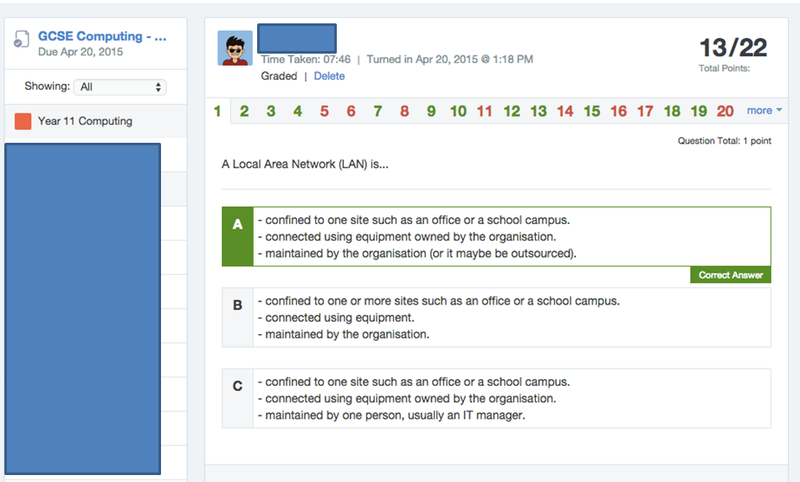 – it clarifies for the teacher exactly what the students need to know and enables more precise planning. – it serves as a good benchmark for students at the beginning of a topic. Seeing the required knowledge laid out in front of you on a side of A4 is extremely powerful and will enable students to highlight what they are already know. – when it comes to revision, students have real clarity about the knowledge they need to know. During my relatively short time as a teacher, when starting a new topic I may have shared a vague outline of what the topic will involve but never to the detail suggested in Joe’s post. I feel like a trick has been missed here, which is why I plan to experiment with knowledge organisers from this point forward. 2. Sequencing lessons in the run up to exams by Andy Tharby. 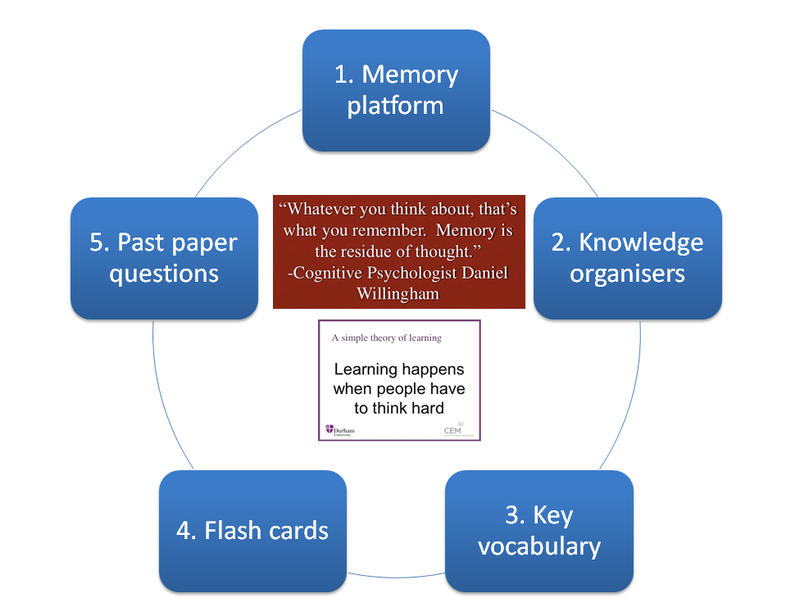 1) Begin with a ‘memory platform‘ where they will be tested on key knowledge/quotes from the knowledge organisers using a wide range of quizzing methods. Students need to be fluent in this knowledge and to do this they will need to cover it repeatedly. They will be encouraged to elaborate on these points of knowledge, exploring their wider significance. 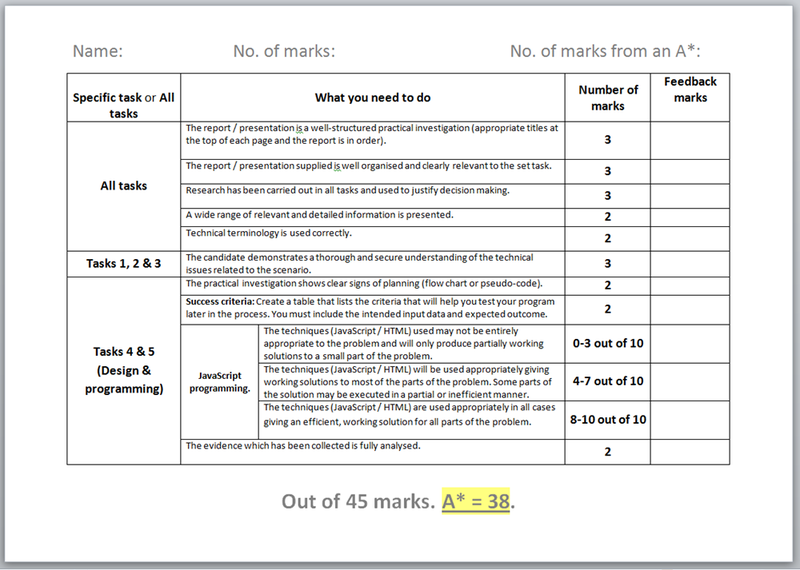 2) Revise and extend a key area. OMAM and AIC – the green lessons – will be taught side-by-side, whereas the poems will be revised in pairs. 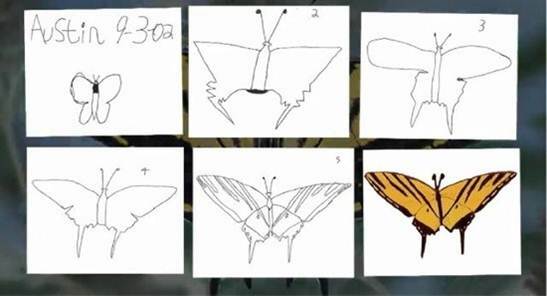 3) Lessons will end with 15 minutes of deliberate writing practice where students will be expected to hone the finer parts of their analytical style by writing a paragraph at A/A* standard – this is a top set – based on the content of the lesson (modelling and scaffolding will feature here too). 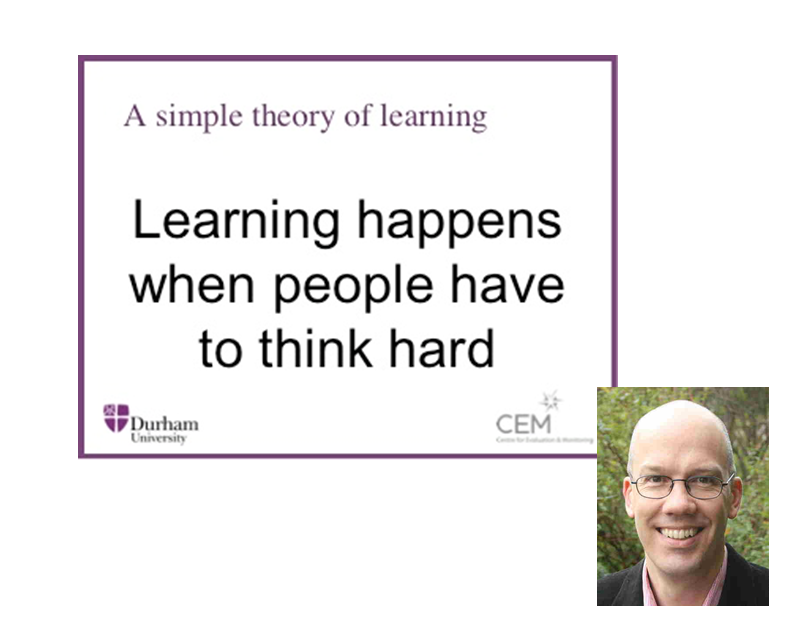 If learning happens when we think really hard about something and we remember what we think about, then engaging students in activities, practices and routines that encourage this is probably a sensible course to take. 1. Start with a memory platform, usually a multiple choice quiz (these are deliberately rigourous with any one of the three answers a potential correct answer, forcing students to study the different answers and think hard about theirs). 2. Knowledge organisers. I have only just started using these as prompted by Joe and Any’s blog posts earlier this week. But I intend to use them at the beginning of teaching a topic as well as revision. It’s a collection of documents that will be referred to throughout the entire course. in revision sessions the knowledge organiser is an opportunity to see an overview of the knowledge and pick out the things they can remember and the things that they need to revisit first. 3. Key subject specific vocabulary. 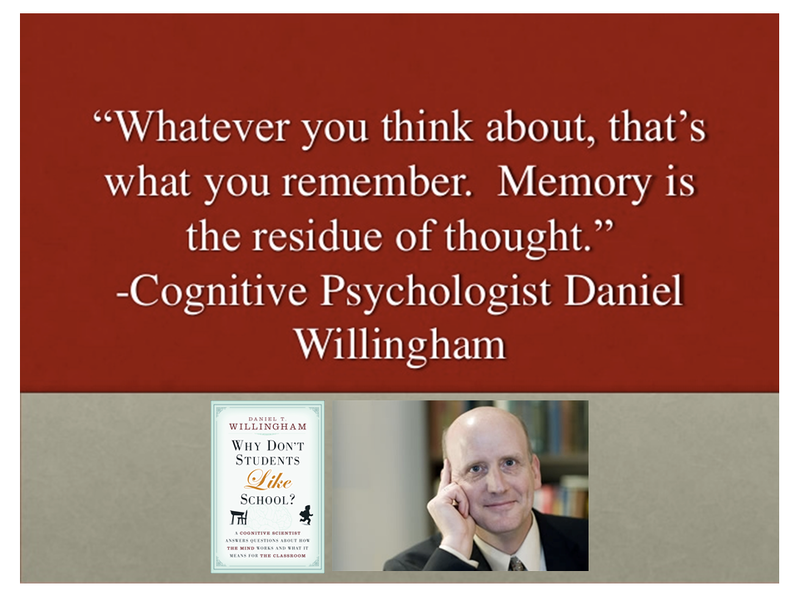 Students are then given time to recall key terms from memory for a particular topic. This is followed up by the TLAC technique ‘Check or change’ where students check their definitions against correct definitions and make changes if needed. 4. Flash cards. Students are then given time to create a set of flash cards based upon the key subject specific vocabulary. 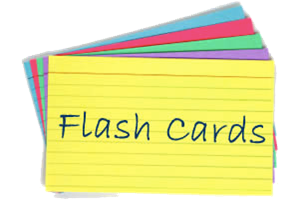 Flash cards have previously been identified as a more effective revision technique. I’m working on the premise that if students are comfortable with the subject specific vocabulary then they should be able to at the very least attempt every question for that topic (obviously they need to understand the context of each question, that comes next). Feedback from students has been really positive as the motivation to use the flash cards appears to be higher than to write out copious notes. a similar question (that requires the same knowledge but uses a different context) is then used as a starter in the next lesson. … from a teaching perspective, revision sessions certainly seem more focused with a greater clarity of what students need to know for each topic which lends itself to more precise deliberate practice. 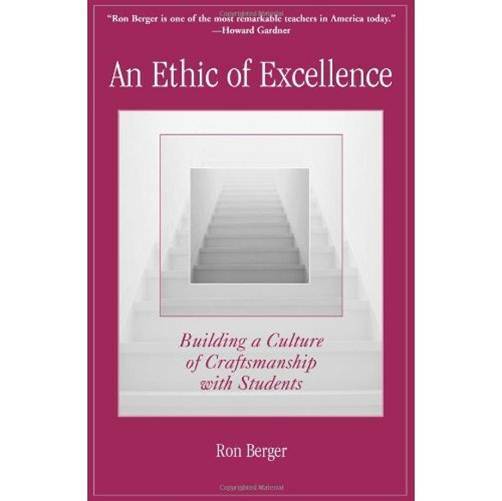 … students have a much clearer picture of what they need to know and the work they are producing is of better quality and a greater depth. Students are more inquisitive and motivated to increase their knowledge. … lessons have a greater sense of urgency to them. 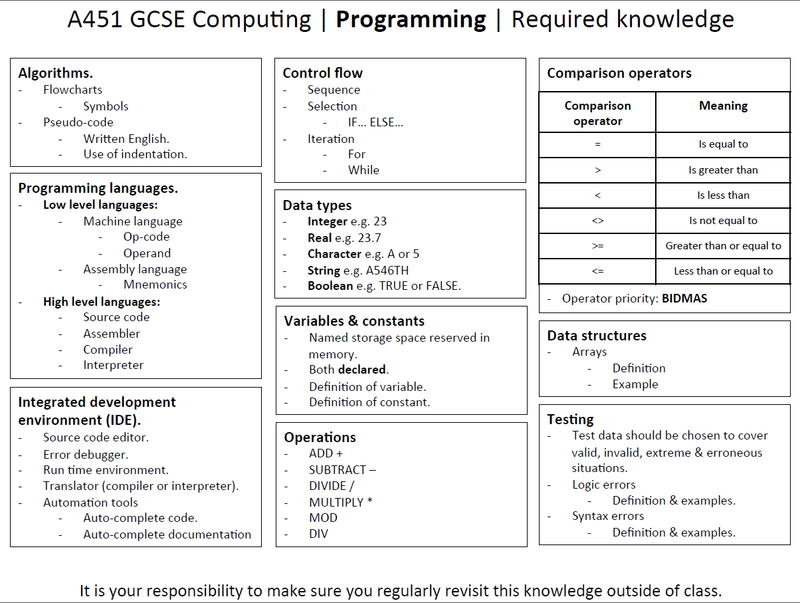 RESOURCE: GCSE Computing knowledge organisers. Updated GCSE Computing revision pack. Below is a link to a GCSE Computing revision pack that i have recently updated (and simplified) which focuses on past paper exam questions. identify gaps in knowledge before attempting questions. define keywords and build subject specific vocabulary. mind map key areas of each topic. 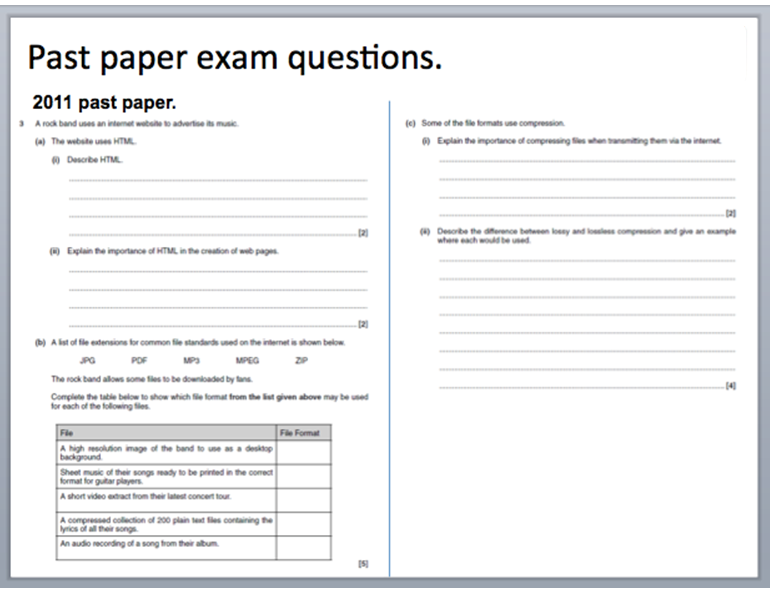 attempt past paper questions by topic. You can read more about my thoughts on revision here. **Also check out this great resource from @teknoteacher – GCSE Computing revision. Here’s a video in which he explains the use of the resource – click here. He is also running a series of free computing webinars for teachers – click here to find out more. 2014 has been an extremely busy year both professionally and personally. I have taken on more responsibility and challenge at school as part of an extended leadership team, focusing on teaching and learning. Me and my wife are expecting our first child in April 2015, which means things are changing (in a good way!). It has been almost two years since I set up this blog and it has enabled me to reflect much more deeply on my own learning in teaching and leadership. Here’s a few things (in no particular order) I have learnt / achieved in 2014. 2. Prioritise the main thing. What one thing could you do more of that will have the biggest effect in school? This was a question posed by the Principal at one of our SLT meetings. Quite often the urgent takes the place of the important. there’s always an email that needs replying to or some marking to be done, but in my leadership whats the one thing that would make a bigger difference across the school? Getting into classrooms. The last 2 weeks of term I managed to walk classrooms every other day for about 45 minutes. This enabled me to talk to students about their learning, talk to staff, champion great practice and give live feedback with no grades. In discussion with other members of SLT I believe we have learnt more about the typicality of teaching then planned learning walks or observations. 3. TeachMeet #NeverStopLearning. In hindsight it was probably a bit ambitious trying to get teachers to attend an evening event the day before term 1 came to end, but that did not deter just over 100 teachers making the effort. The event was a great success with David Didau providing a very thought provoking keynote. There were some excellent workshops from Nina Jackson, Lucy Crehan, Crista Hazell, Zofia Higlet, Amber Bracey, Alex Heath, Chris Baker and Rory Gallagher. The evening was wrapped up in style with a plenary from Mark Anderson. These evenings are always inspirational to the people that attend and give people an opportunity to look outward from their school to seek new ideas. 4. Time. Since starting my new leadership position i have found the most useful resource I can offer colleagues is time. Whether it’s a colleague unloading after a bad day or seeking support in a lesson or just a chat. No matter how busy I am I will always offer time and enthusiasm for my colleagues. 5. Reading. 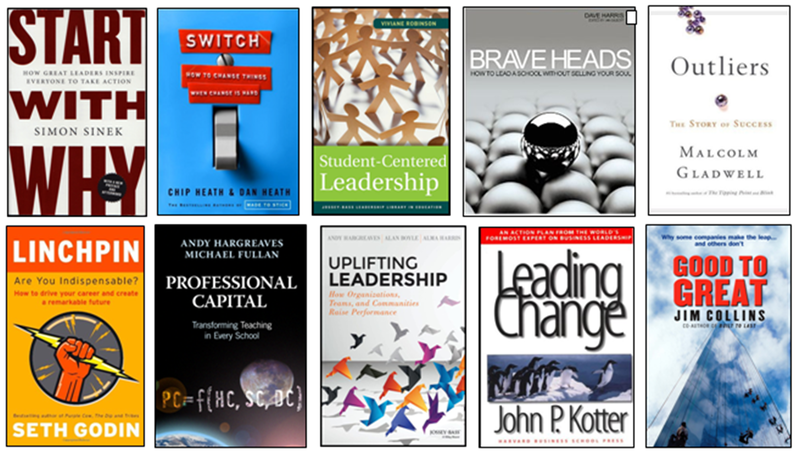 I’ve read a number of teaching and leadership books this year (see my reading list). Continually building my knowledge and exploring new ideas is something I hope to continue to do for the rest of my life. It’s something I genuinely enjoy and thrive on. I want to be continuously challenged – it’s something that help keeps me to keep pushing the limits of my own capability. 6. Colleagues. I am fortunate enough to work with some remarkable colleagues that inspire and challenge me on a daily basis. Seeing colleagues thrive in school and enabling them to pursue ideas and try things out has been one of the most pleasing aspects of my work in 2014. I had the absolute pleasure of working with a fairly large cohort of NQTs these past two terms and it has been one of the highlights of my career so far watching them grow and develop, meeting challenges head on and coming up with creative solutions. A real inspiration. 7. Students. They are truly wonderful (each in their own way). Whenever I am involved in strategic decisions I always try to come back to the students and how it will help improve their outcomes. Keeping the main thing the main thing. Everything thing I do in school is focused around the students. One of my main duties in my leadership role is organising CPD for teachers, a role I don’t take lightly and one that I will work tirelessly to ensure teachers value CPD and feel suitably challenged by it. Great CPD enables teachers to thrive which helps children to succeed. 8. Running. 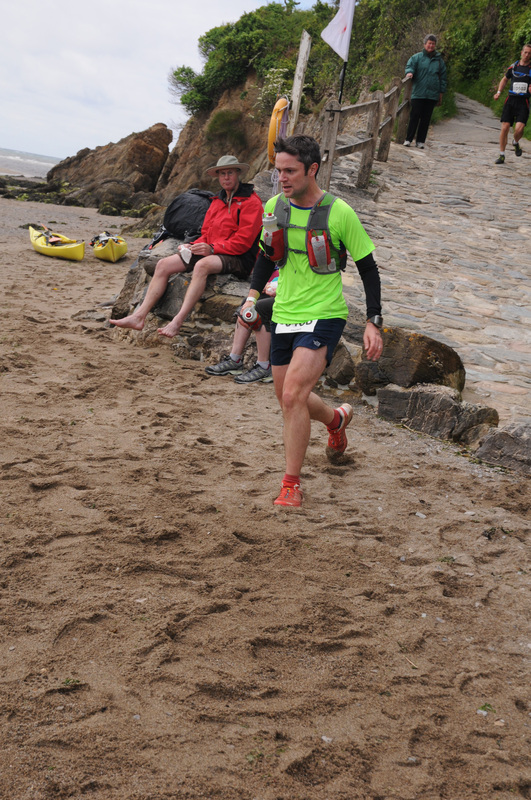 I managed to complete my first 100km race in 2014 in addition to several other ultra marathons and marathons. This is not something that happened over night and is the accumulation of a few years of training, patiently building up the distance. Running is now part of my life. It clears my mind and puts things into perspective. First 100km trail race completed in 2014. 9. NPQML. 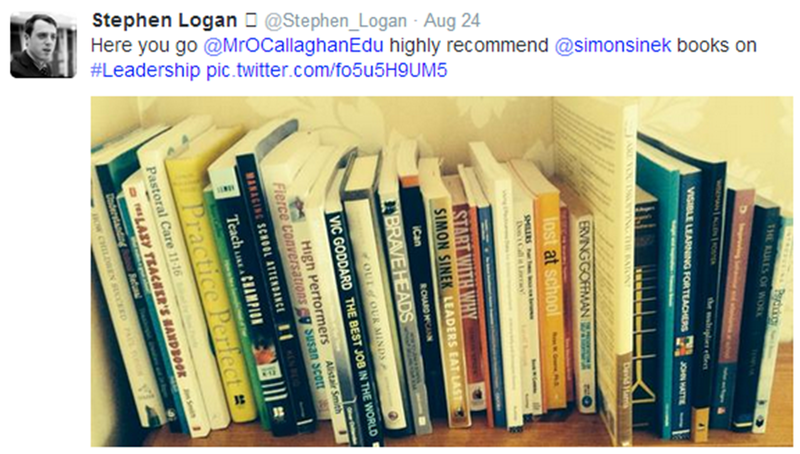 I successfully completed the NPQML course in 2014 which opened up a number of doors. My project aimed to raise the profile of effective, challenging CPD across the school to help drive up student outcomes. As a result of my project I was able to work with a team of great teachers to organise to run a number of CPD sessions, INSET workshops and deliver a teachmeet in March (the second quickly followed in October). As a result of my project I was given the opportunity to deliver my first keynote speech at a National Education Trust event at a school in Bracknall sharing a bill with Roy Blatchford and Lucy Crehen. 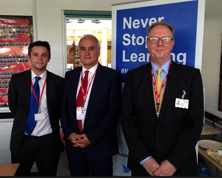 I was able to (briefly) discuss my project with Sir Michael Wilshaw after being observed by him during a visit to my school. I was asked back to speak to a new cohort of teachers starting the NPQML course which i really enjoyed – it’s always inspiring speaking to teachers who have a genuine desire to have a positive influence whole school. Next steps (in no particular order) – what does 2015 have in store? 1. Increase leadership capacity. The best way to learn is to do. In 2015 I hope to take on further line management responsibilities as this will give me an opportunity to work with more teachers and help them thrive whilst learning from them at the same time. I see accountability as helping colleagues to achieve their goals. This may lead to some difficult conversations but if it’ll help more individuals thrive then its a conversation worth having. 2. Secure an Assistant Principal post. About 18 months ago I decided that I wanted to become a headteacher and my next step is to secure an Assistant Principal post – a challenge I am ready for. I have learnt so much in the last 4 months working alongside a remarkable leadership team. I’ve finally had the opportunity to put into practice a lot of what I have read. I’m learning everyday from every meeting, conversation, call out duty, break/lunch duty, lesson observation, NQT session and I want to pursue leadership to the highest level so that I can help as many students and staff as possible. I feel a real allegiance to public service and I want to dedicate my career to it. 3. Reading. Continue to read as much as possible in order to develop my ideas around effective teaching & learning whilst also developing my ideas around leadership. The more I read the more I question. The more I question the closer I get to understanding. 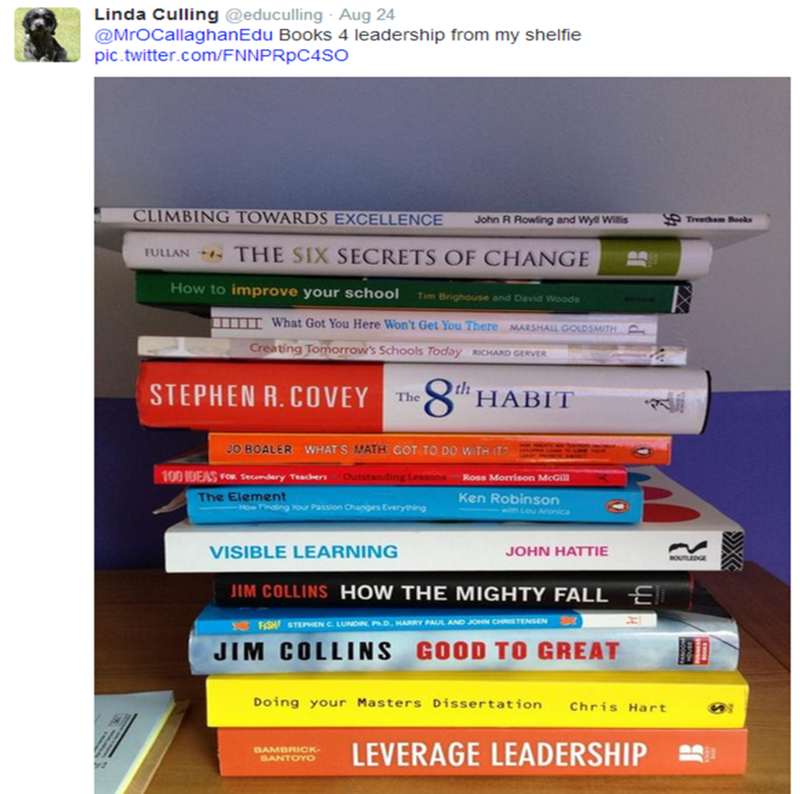 Some books currently in a pile waiting to be read include: ‘Formative assessment’ by Dylan Wiliam, ‘Visible learning for teachers’ by John Hattie, ‘Built to last’ by Jim Collins and ‘Leading change’ by John P Kotter. 4. Keep my moral purpose at the centre of decision making. This is really important to me and something that I try to keep at the forefront of my mind. As I progress in my career I am exposed to more of the day to day activities that make a school run which could start to cloud ones vision. Yes these processes are important but never forget why you do what you do. Schools are a people place that thrive on great relationships – students, staff, parents/carers and the wider community. What is your moral purpose? 5. Make my business getting into classrooms. As part of my leadership role I want to help develop an ‘open door culture’ which doesn’t currently exist in my school. In order to do this I need to re-prioritise my work. It’s far to easy to get sucked into your office and a never-ending flow of emails. 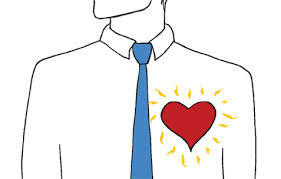 As part of a leadership team that is truly seeking to help teachers thrive and students achieve the best thing we can do is be more of a present around the school and get into classrooms, build more trust with teachers so that it’s completely normal for SLT to be in and out of classrooms supporting and learning. 6. Running. With a baby on the way and a demanding job I have to be realistic. I want to keep running on a weekly basis and i’m hoping to compete in a 50km in February, but I expect ultra running will take a back seat in 2015 until iI can afford the time to train properly for it. 2016 will hopefully see a return to the 100km distance and my first attempt at a 100 mile race. 7. Family matters. 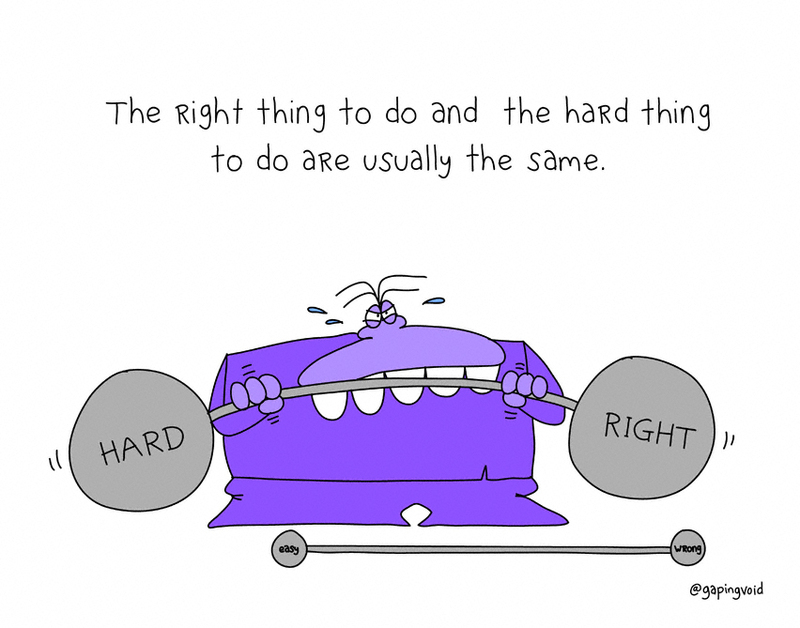 I look forward to wrestle with the work/life balance monster in 2015 and I hope to tip the balance in my favour by working smarter. I am lucky to have an amazing wife and a remarkable family and I need to ensure I make the most of both. This is a non-negotiable. 8. 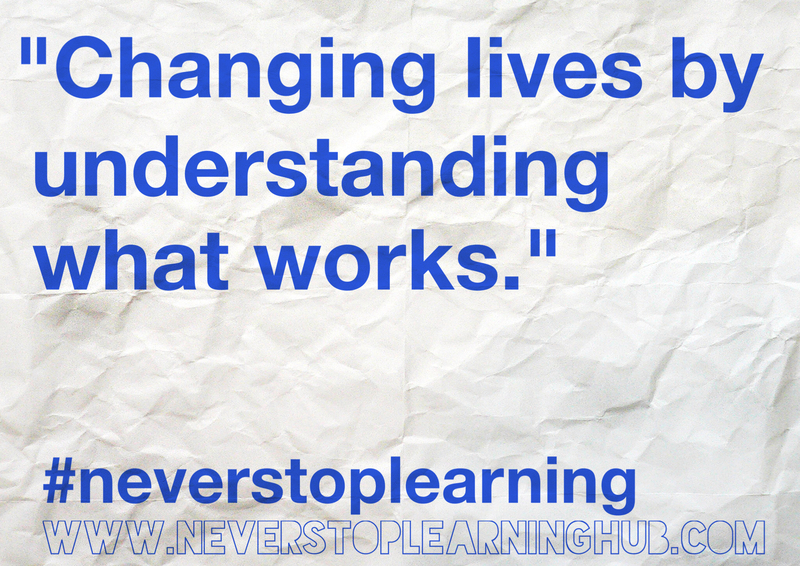 #NeverStopLearning. 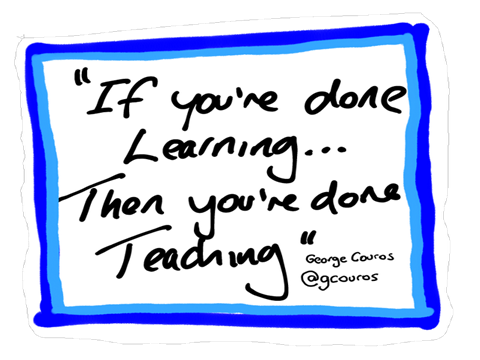 This is the phrase I have adopted to promote continual professional development although I apply it to all aspects of my life. I don’t want to ever settle for OK. I am devoted to meaningful work that produces remarkable outcomes. To achieve this I need to continue to listen, learn and grow. Finally, a big thank you to all the people I have interacted with via Twitter (and in real life!). The discussions that I have been involved in and observed have broadened my thinking and made me question things more. The number of thought provoking blogs currently circulating is phenomenal and I wish I had more time in the day to read them all! It was these posts that initially inspired me to start a blog. 2 years on, 36 blog posts later and over 28,000 views has not only empowered me to reflect to a deeper level but it has also enabled me to encourage more teachers to get involved, get connected and deepen their understanding. Here’s to a great year in 2015 | Keep making a difference. In my last post on leading whole school CPD for teaching staff I described my plan for the year and my thinking behind it. Now that the first term is over it seems like a good time to reflect on how the schools vision for genuinely continual, personalised CPD is taking shape. At my school CPD sessions are scheduled every other Wednesday afternoon throughout the whole year. During term 1 these sessions were given over to departments. This has been really popular with staff and has enabled departments to recap and embed expectations whilst sharing great practice. In preparation for this department heads were asked to submit a plan for the sessions (brief summary of what would be covered in each session). This was really useful for me as I was able to see at a glance what departments were working on and also start to connect the dots across the school – linking up departments that were focusing on similar things. Outside of the Wednesday afternoon sessions being run in departments I now had term 1 to set up and embed optional CPD activities for staff, something that had not happened before in school. Before I outline some of the optional activities, first let me explain my thinking behind this approach. In John Kotter’s book ‘Accelerate’ he puts forward an idea of how great organisations stay creative and innovative as they grow in size. When most start up companies begin they don’t tend to have a hierarchical structure, instead they work in small groups that collaborate and innovate with flow. This is in essence one of the driving forces behind successful start up companies – their ability to work in a way that is free from hierarchical structures which encourages and enables innovation and creativity. Ironically as these companies grow into large organisations they tend to develop a more structured hierarchy and lose the spark of creativity they once had when they were a small start up. Kotter argues that the truly great organisations run what he calls a dual-operating system – they have a structural hierarchy to ensure organisational accountability but they also deliberately create opportunities for groups of people to get together and collaborate outside of this structure. This is what I wanted to create with optional CPD activities – opportunities for people (regardless of job role) to get together and collaborate on things they are interested in. Making these groups optional means you get the right people on the bus at the beginning which increases the chances of success. Success is teachers talking about teaching. Success is collaborating in meaningful ways which empowers people to take action and improve because they feel passionately about doing so. Positive relationships with staff and students. 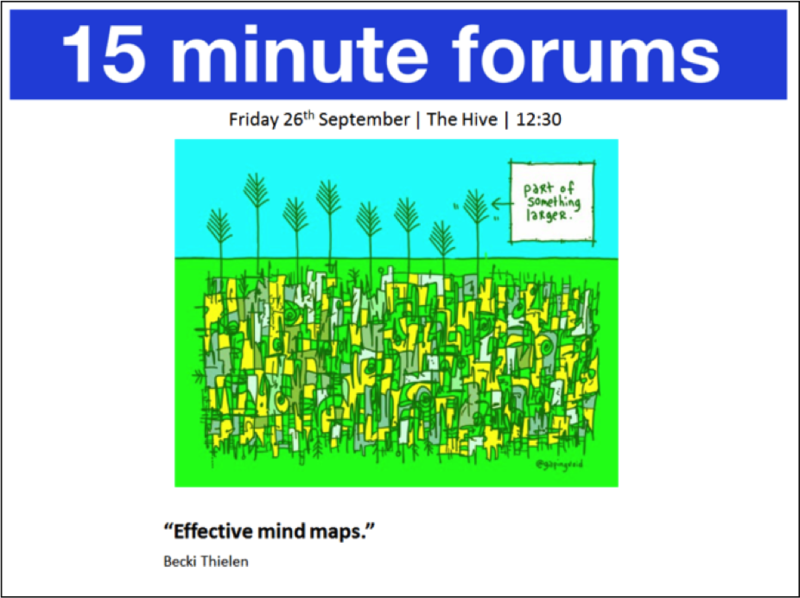 Effective mind-mapping techniques for revision. What has been really pleasing is that the sessions are not necessarily about someone giving you a ‘silver bullet’ on how to do something. The theme that has evolved is that staff bring something they are working on, explain their thinking and any impact it has before others from the group share their experiences or thoughts on how a strategy could be improved or implemented more widely. Another relatively easy activity to set up. I choose the book ‘The hidden lives of learners’ by Graham Nuthall to start of with (after the first cycle I will be asking staff to submit book options and then vote on a range of books). I sent an email out to all staff advertising the activity and set a limit of 10 places. Within a couple of days the places were filled, books were given out and the ball was rolling. 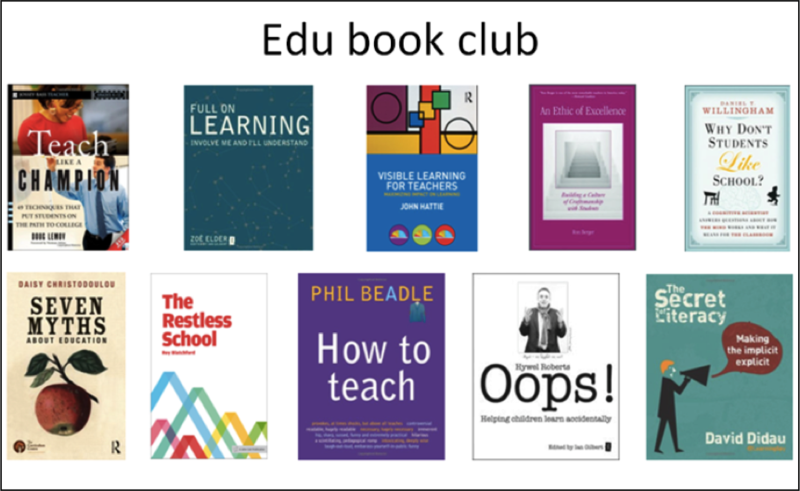 Towards the end of term 2 we will meet to discuss the book and present back to the staff body during a morning teacher briefing on what we found out. 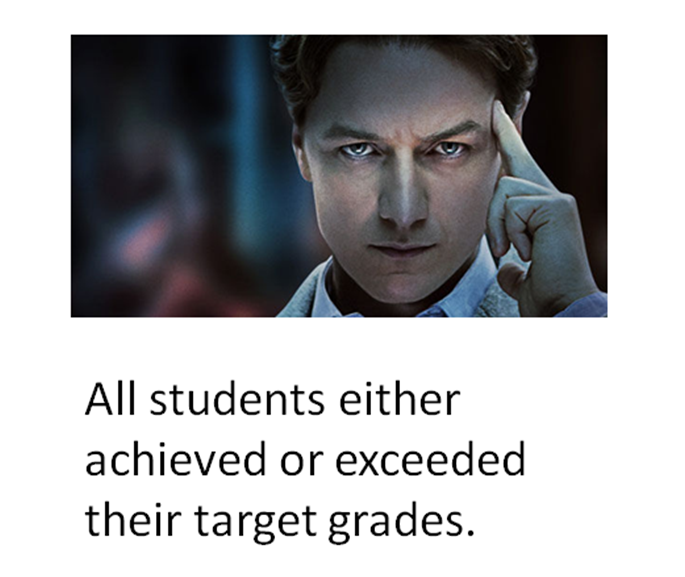 No grades no forms. 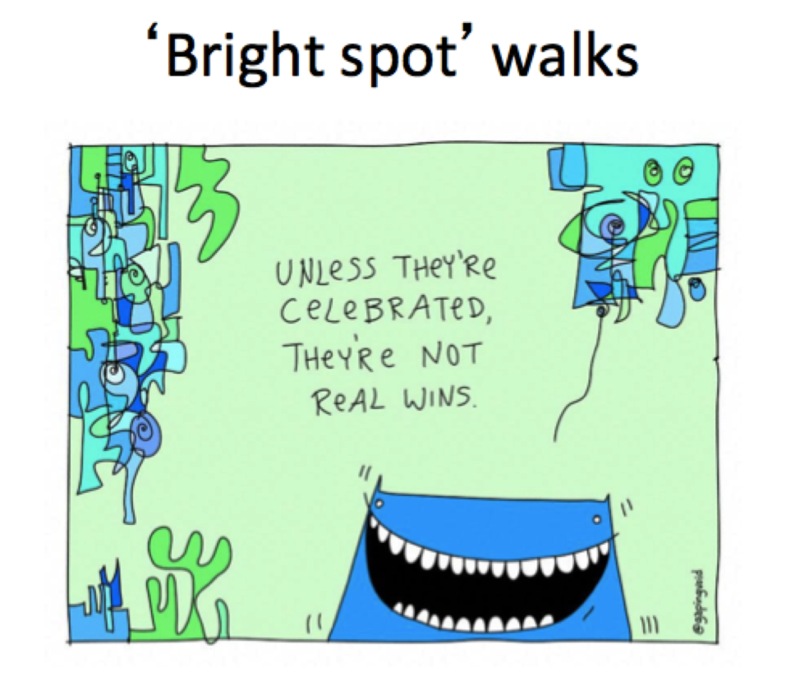 The purpose of these learning walks is to find great practice, those bright spots that exist somewhere in every school. I conducted one in our Science department recently where I managed to take pictures of several great resources and bits of student work. 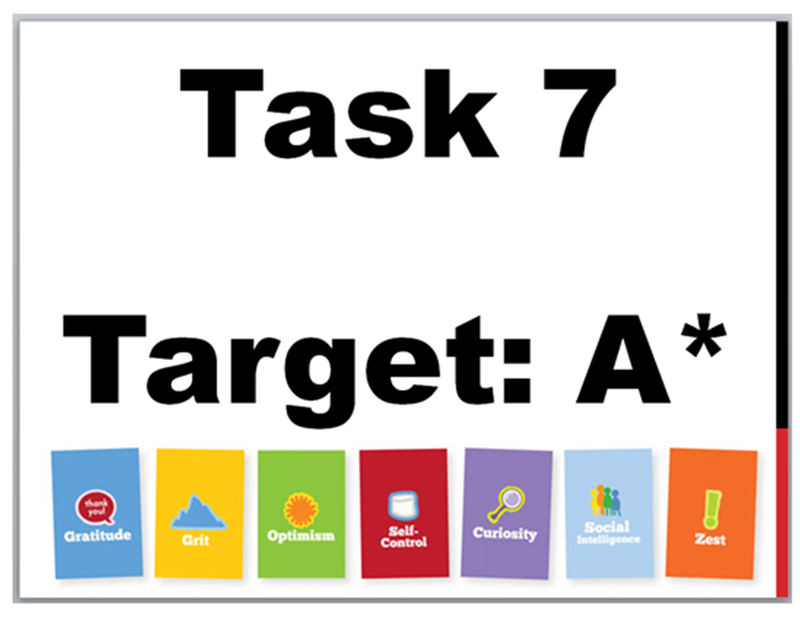 These then go into a presentation which can be used for a teacher briefing. During the teacher briefing you display the images and ask colleagues to explain more about the context of what was going on in the lesson and how the resource / strategy helped. Longer term I would like to create more of an ‘open door’ culture across the school and involve staff in searching out the bright spots for themselves. I’m not sure if it was over-ambitious and just stupid to organise a TeachMeet for the penultimate evening of an 8 week term, but I did and it offered another opportunity for staff to get involved. Just over 100 heroic teachers from different schools (across multiple phases) showed up for an evening of having their thinking challenged whilst also being inspired and thanked for their hard work. The theme of the evening was about understanding what works rather than just being bombarded with 1000s of ‘quick wins.’ TeachMeets are a great opportunity for expanding your thinking, developing ideas and networking with great people outside of your immediate day to day surroundings. Last weeks event was brilliantly captured by David Vignolli (a visual artist from London). Now that these activities have been set up it’s my role to ensure they continue (for as long as they are useful to people). My hope is that these additional activities provide staff with opportunities to engage and develop in ways which suit them. The one size fits all approach to CPD is dead. To make great teaching a typicality across a school, staff must be given meaningful opportunities to develop and feel supported in doing so. Investing effectively in staff will ultimately lead to better experiences for the students which is what all of this is about after all – the students. 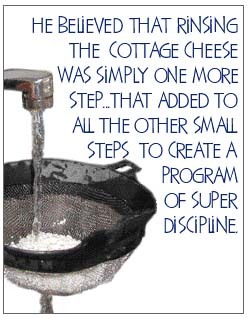 Rinsing the cottage cheese – making CPD meaningful. 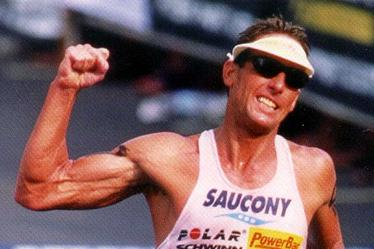 Dave Scott – 6x World Ironman champion. Dave Scott is a 6 times winning world Ironman triathlete who left nothing to chance. During peak training you could catch him cycling 75 miles, swimming a few 1000 metres and running up to 20 miles on a daily basis for weeks on end. In order to win six world championships he continued to reflect on his training and make tweaks to it in order to achieve optimal performance (much like the British cycling team under Sir David Brailsford – searching for a series of small marginal gains which would combine to produce a larger impact on performance). Dave Scott took it a step further and use to rinse his cottage cheese (not a euphemism) with water in order to reduce the amount of fat it contained upon consumption. He believed that this was one in series of other small steps which enabled him to reach peak performance. This got me thinking about teaching and how teachers develop their practice in the classroom. As teachers we are in the business of changing lives. The best to do this is to get a better understanding of what works in the classroom (rinse our classrooms of wasteful practices and focus on what actually works). CPD is often fraught with difficulties – whole bodies of staff being forced to engage with CPD in one particular way which leads to minimal buy in. One off INSET days on a magical strategy to transform your teaching and the cult of outstanding can also end up leading to more lip service but even less action in the classroom. As David Weston (@informed_edu) points out we need to move our teacher development from awareness to transformative practice if we want teaching to improve. We need to take action. From September I took up a leadership role in my school to lead CPD for teaching staff. I’m passionate about helping all students to succeed and understand that the best way for that to happen is to ensure they are exposed to great teaching. I want teachers to flourish and engage with CPD that personalised and enables them to take control, take action and subscribe to continual improvement in a way that works for them. In previous years CPD has consisted of a ‘one size fits all approach’ and so this year I wanted to do something a little different. Based on the ideas of @Shaun_Allison and @Dan_Brinton I set out to offer a much more personalised CPD programme that focused on transformative activities. 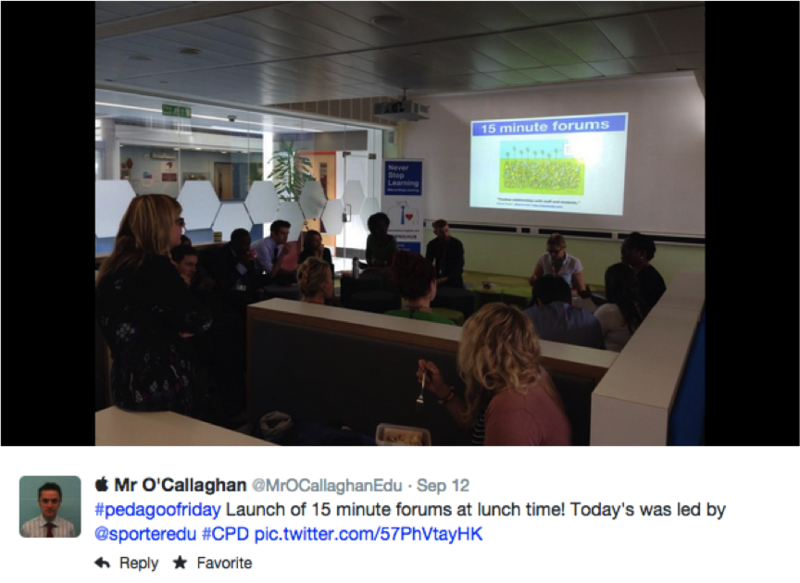 In the rest of this post I’ll attempt to outline the CPD programme I have planned for the year. I adopted @Shaun_Allison ‘s layered approach to CPD. 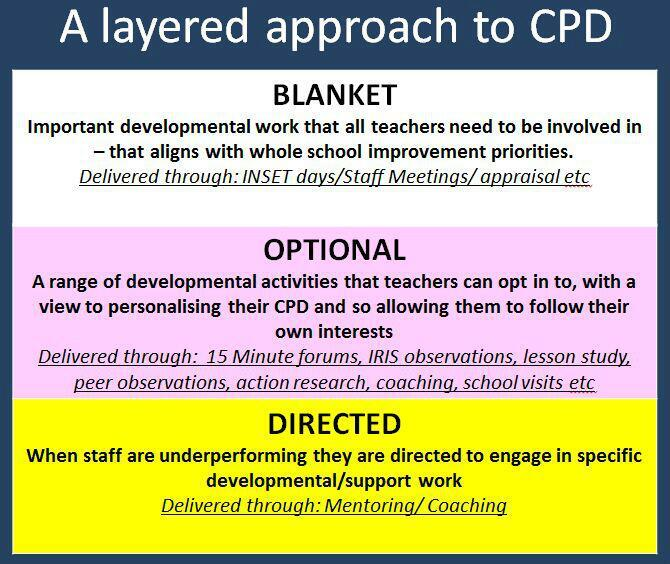 Blanket activities relates to whole staff CPD activities in directed time which in my school equates to one 60 minute session every fortnight throughout the whole year. Optional activities means exactly that – CPD activities like 15 minute forums, teach-meets, Edu-book club that teachers opt into if they want to. These activities are about getting the ‘right people on the bus.’ In order for them to be successful you need to create clusters of staff that want to be involved (and quite often lots do but just haven’t had an appropriate forum to get involved). Directed activities relate to sessions for specific groups of staff like NQTs who may need additional support but also under-performing staff. Providing support for these groups are vital to ensuring that students get the best possible learning experiences. CPD Overview 2014 – 2015. Here’s my plan – Download a PDF copy here. Staff will spend blanket time in departments during terms 1 and 6. Department leaders put forward a plan as to what their CPD will look like in these sessions. It focuses on specific needs of each department. 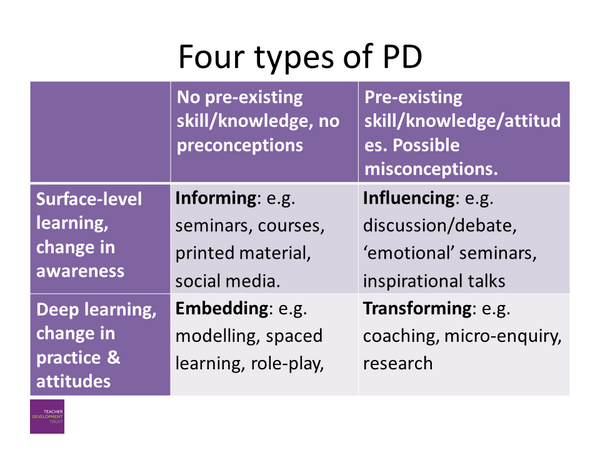 Terms 2 – 5 is where the personalised CPD takes place. Staff will opt into one of four pathways. The staff leading each pathway have opted to lead and take part in their pathway so will not miss out on CPD. During term 5 staff will be given directed time to create a piece of work to explain what they have investigated and then present it in a market-place style event at the end of term 5. 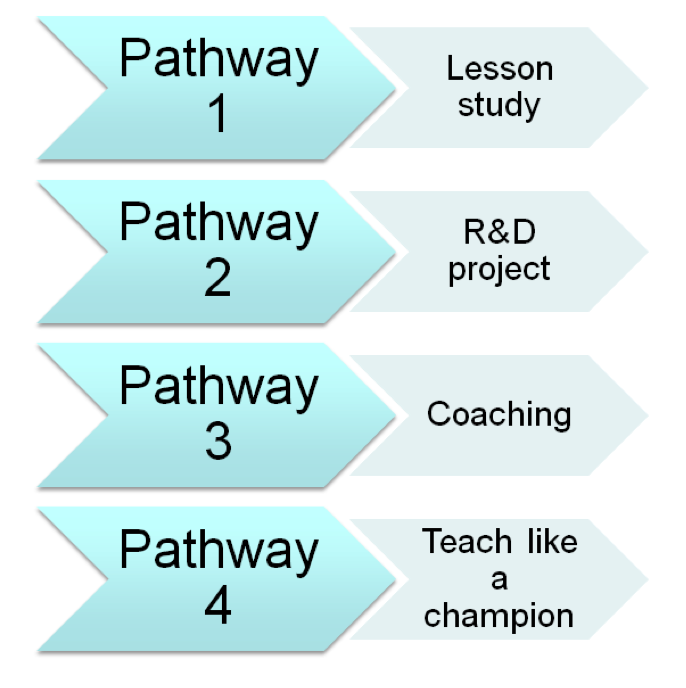 I’ll blog about each pathway in more detail later in the year. Outside of the blanket sessions there are a number of optional CPD activities aimed at building a culture of continual improvement. So far take up has been overwhelmingly strong for the optional activities. Teaching is difficult but rewarding. We fail at it a lot which provides us with opportunities to learn more about what works and what doesn’t. Engaging with research is an accelerator that can challenge the way we think about teaching and in turn move our practice forward. So lets strip away the novelty gestures, rinse our cottage cheese and get better at understanding what works. Teach like a champion by Doug Lemov. 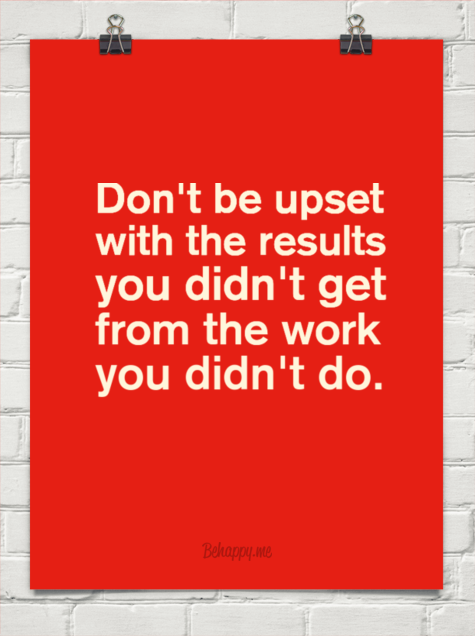 ResearchED – Working out what works. DIY Teaching CPD by Stephen Tierney. About 18 months ago I had a moment of clarity and made a decision that I wanted to become a head teacher. Why wouldn’t I? It makes sense to me. I want to make a positive difference to as many young people that I can and allow as many colleagues to flourish as possible. I thrive on challenge both professionally and as a hobby. Since making that decision I have been busy learning and taking action. I decided not to wait for permission to lead but to start leading. Leading with a clear moral purpose. Leading by example. Leading with a sense of urgency but also on the side of caution. Leading to improve. It has been an extremely busy 18 months but equally rewarding. As a result I will join my schools leadership team in an extended leadership role responsible for teaching and learning CPD from September. I owe a lot to the inspiring colleagues I have the honour of working with but also to the extensive list of leadership books that I have ploughed through. They have given me lots of ideas to think about in terms of leading teams and implementing change. Increasing my knowledge through reading has also allowed me to spot ideas from books in a school context (usually school improvement) and give me a deeper understanding of how ideas from books can be implemented in a school setting. 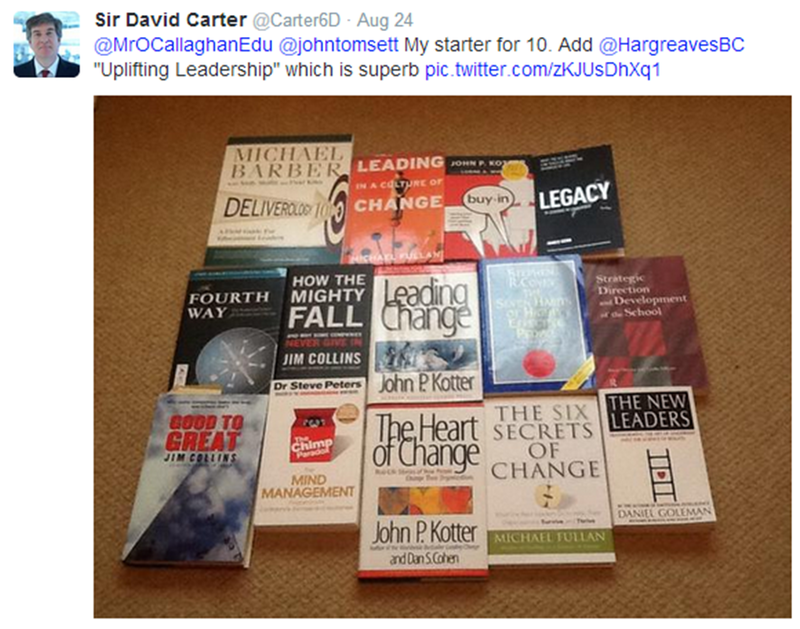 Following on from my post on Reading for CPD, the following is a list of books to get you started on (or to add to) your leadership journey. The list is by no means comprehensive (and is in no particular order). It is a mixture of my own reading list and contributions from people on Twitter. Please add more titles in the comments section at the end of the post. 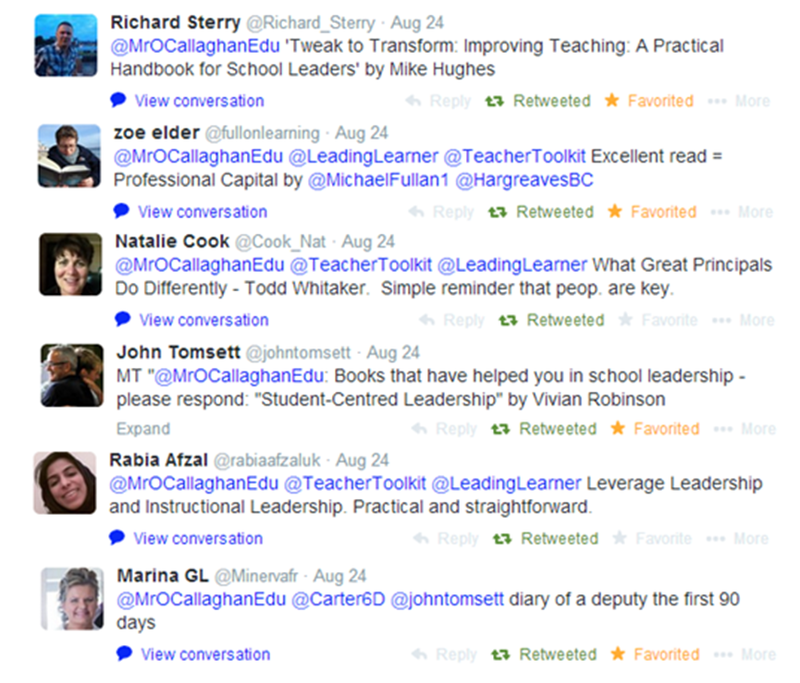 A collection of school leadership books crowd sourced from Twitter. 1. ‘Start with why’ by Simon Sinek. 2. ‘Switch: How to change things when change is hard’ by Chip & Dan Heath. 3. ‘Student-centred Leadership’ by Viviane Robinson. 4. ‘Brave Heads: How to lead a school without selling your soul’ by Dave Harris. 5. ‘Outliers: The story of success’ by Malcom Gladwell. 6. ‘Linchpin: Are you indispensable?’ by Seth Godin. 7. ‘Professional Capital: Transforming teaching in every school’ by Andy Hargreaves & Michael Fullen. 8. ‘Uplifting Leadership: How organisations, teams and communities raise performance’ by Andy Hargreaves. 9. ‘Leading change’ by John P. Kotter. 10. ‘Good to Great’ by Jim Collins. More to explore – thank you Twitter! Don’t wait for the right role to emerge. Take action and create your own role. 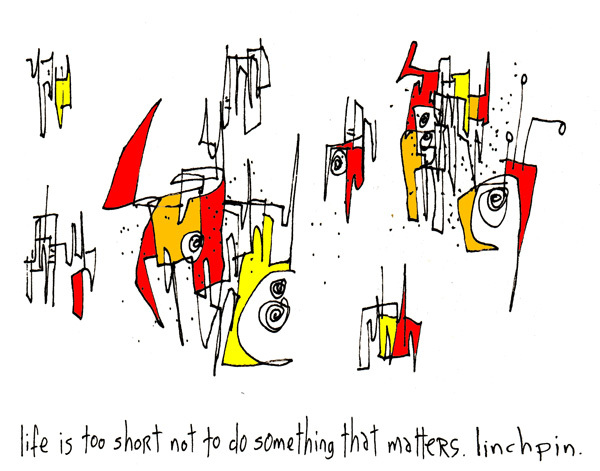 Life is too short not to do something that really matters.